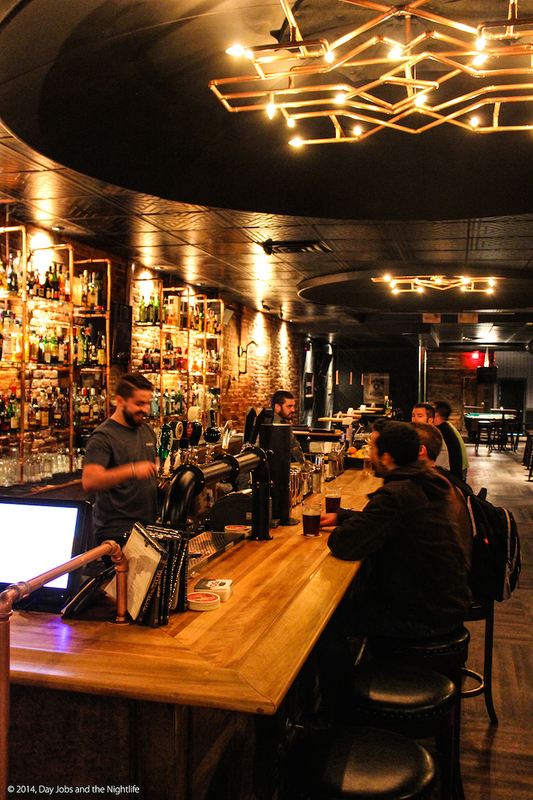 On paper, Midway is still the same bar it was in 1927 but the story behind the bar’s revival is as colourful as the history that this St. Laurent staple has witnessed for almost 100 years. 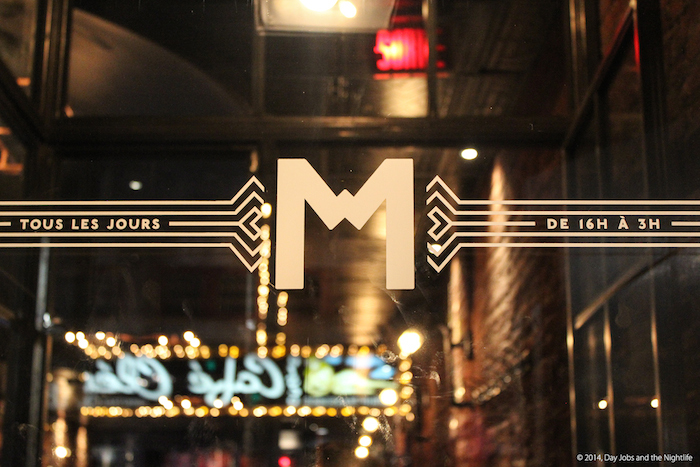 Montreal has seen its share of ups and downs since then and from the windows of the bar, Montrealers have watched the decades roll by. A friend and I were halfway through an evening a couple of weeks ago and wanted to go for a pint after dinner. We so happened to be near Midway on St. Laurent and went in to see what the place was all about. I’ve wanted to try Midway since it’s opening a couple of months ago but hadn’t had the chance to drop in. I had chatted briefly on the phone with one of the owners, Charles just before the opening. As we entered the bar I realized that now was my chance to get the story first hand, face to face from another owner, a man named Max. Max told me that getting Midway was not as easy as you might think. A very long courting process was required to gain the trust of the former owners whose whole life and retirement were all wrapped up in this watering hole. After several encounters and dozens of draught later the man was finally ready to hand the reigns over to these four young guys who had convinced him that they would not ruin the legacy of the bar. A little over a year ago the bar changed hands and the 4 new owners made a promise to the former owner that the heart and soul of Midway would remain intact. 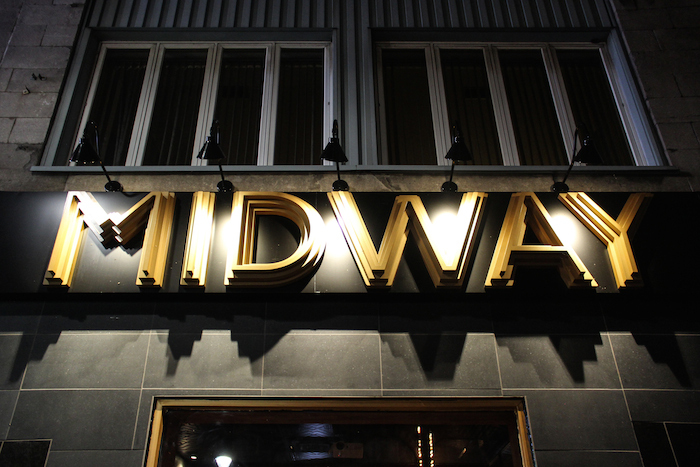 Considering that Midway is one of Montreal’s most veteran bars and had only a single proprietor not much had been done over the years in renovations. Once the new guys came in it was understood that the bar would have to be essentially stripped from tip to tail. 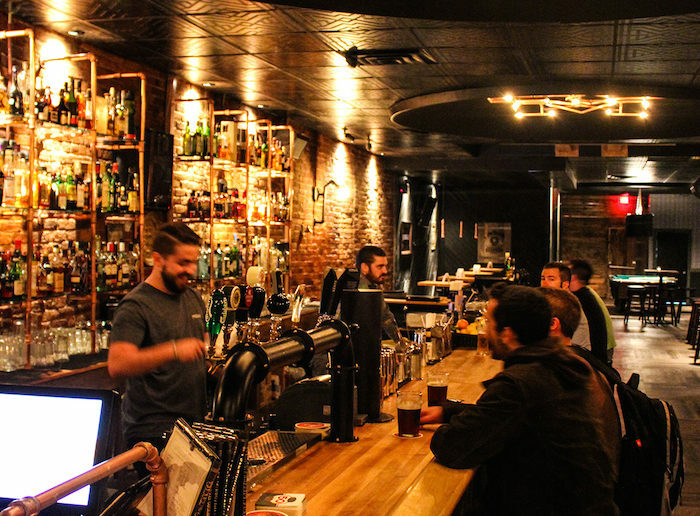 The dive bar that once was is now restored to the glory days of St. Laurent were the rolling lights of the marquee lit up the street and the night. 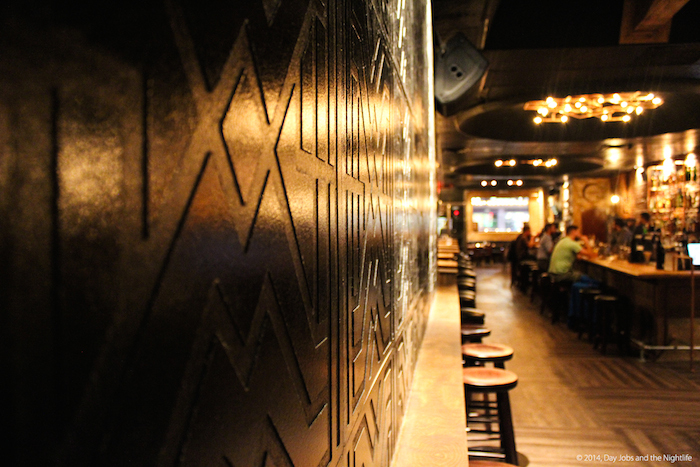 Most elements in the new Midway were thought out and custom made exclusively for the bar. 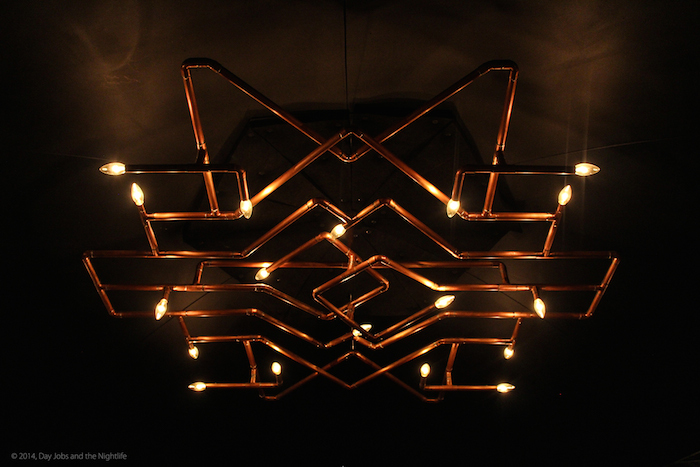 Art deco walls with a stylized M’s and W’s can be seen almost everywhere from the custom made and one of a kind copper light fixtures to the ceiling tiles and even the covering on some of the walls. Midway serves up drinks of all kinds and they make one hell of an Old Fashioned. For now there are no plans to serve food and I’m ok with that. Sometimes a bar can be just a place where to you get together with friends for 5a7, a hockey game or whatever sparks your fancy. There’s lots of space at Midway and the bar is lined with seats facing a set of bartenders and owners who are more than happy to strike up conversation. After a couple of pints we darted back out onto the Main. Passing by the window under the Midway sign I couldn’t help but wonder about all the things that must have happened within those walls and about all the Montrealers who have laughed and drank at Midway.